Let’s face it, healthy food is not always delicious. 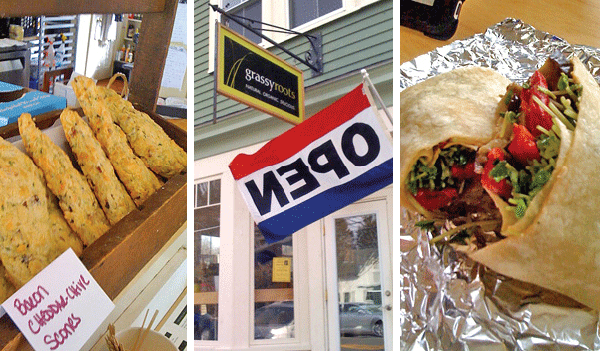 But we’re happy to report that at a lovely new spot in Wenham, we found a lunch you can feel good about. 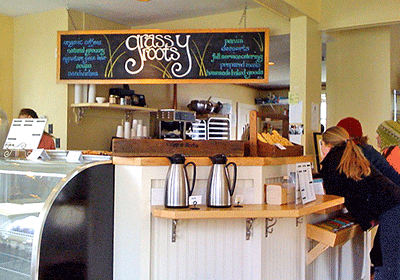 We stopped into Grassy Roots last weekend and were delighted by the airy space and the fresh selections. 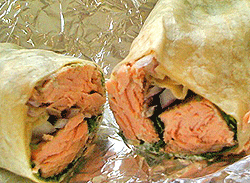 The store carries a great selection of smoothies, sandwiches, salads, and panini, along with fresh baked goods. We tried the Lovely Viola, which featured large chunks of moist poached salmon, arugula, onion, and dill tartar ($10). Definitely worth returning for. We felt the same way about the Barstool, a combination of roasted eggplant, hummus, roasted red peppers and watercress that tasted incredibly fresh and more decadent than most vegetarian sandwiches ($8). Of course, since we wanted to report on all of the shop’s offerings, we had to try a few of the goodies on display. Honestly, the things we won’t do for you people. The triple chocolate brownie was dense and fudgy, though we’re not sure the small size was worth $1.50; the muffins were moist and flavorful; and the cheddar chive bacon scone was one of the best savory scones we’ve ever had—cheesy and smoky with a wonderful light texture. If you’re traveling on Route 1A, definitely stop into this high quality breakfast and lunch spot, and if you try the mocha morning smoothie, let us know how it was because we already regret not trying it. 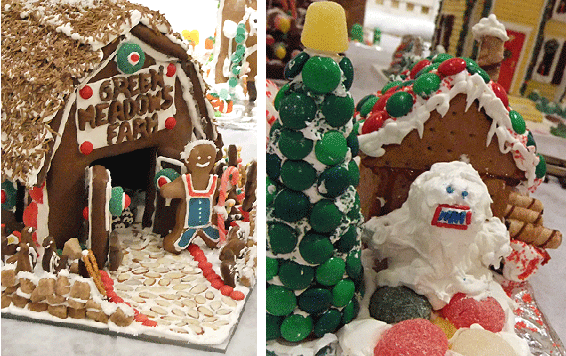 Last week we were invited to see the Wenham Museum‘s 4th Annual Gingerbread Contest and Gingerbread Express Display. 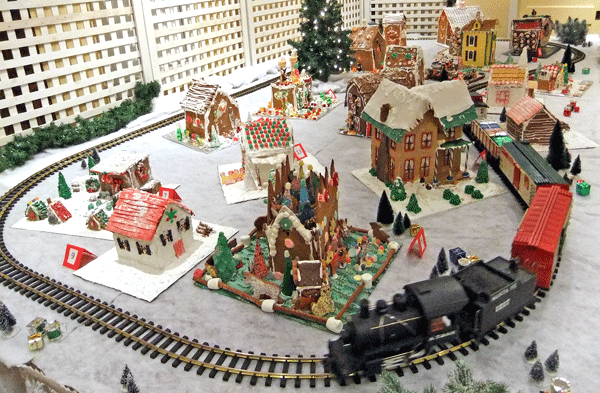 The beautiful creations were set up as a model train village, to go along with the model railroad exhibit currently at the museum. All of the entries were terrific, and we had a great time identifying the various building materials and methods used. Some of our favorites included the whimsical castle in the foreground of the photo above, which had been put together by a group of Girl Scout Daisies. We loved the non-traditional colors and the funky shapes. 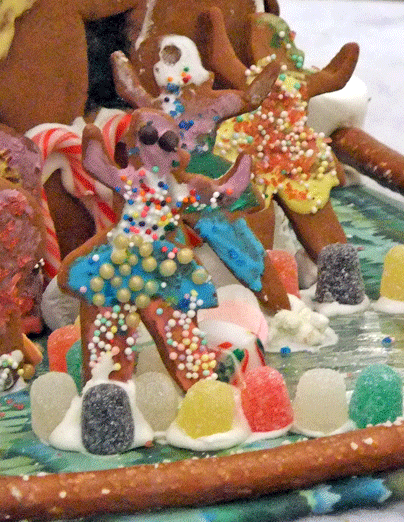 The trio of multicolored ballet dancers twirling through the scene were showstoppers. 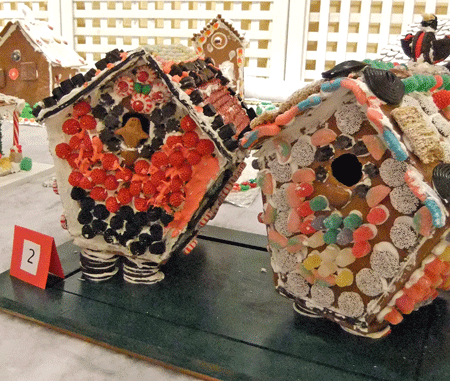 This pair of fantastic birdhouses, put together by a couple of children who enter the contest each year with their grandmother, were eye-catching and fun. We loved the “legs” which made them seem almost like friendly robots. Other entrants included a miniature Green Meadows Farm and a trio of mini-houses that had been put together by teenaged museum volunteers. We loved the little abominable snowman they included. The houses remain on display until the 18th, so stop by the Museum to check them out. If you’ve got the kids in tow, they’ll love the train displays (which run through February 27th), and if you’ve got shopping to do, the Museum shop has some fun and unusual offerings. It’s been a while since we talked about weekend picks, but this weekend there’s so much going on we can barely scratch the surface. 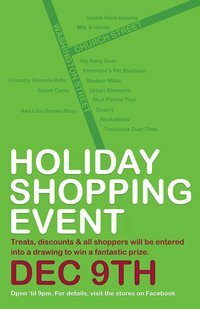 Tonight is a great night to get some shopping done in Salem. Many of the stores are open late and are offering deals and treats to shoppers. Salem Wine Imports will have a free tasting and special discounts; Milk and Honey Green Grocer will offer cheese and crackers, food samples, and 15% off your purchases; and Pamplemousse holds their annual open house from 6:00 to 9:00 with wine, hors d’oeuvres, and free gift wrapping. Also open late tonight are the shops in Hamilton and Wenham. 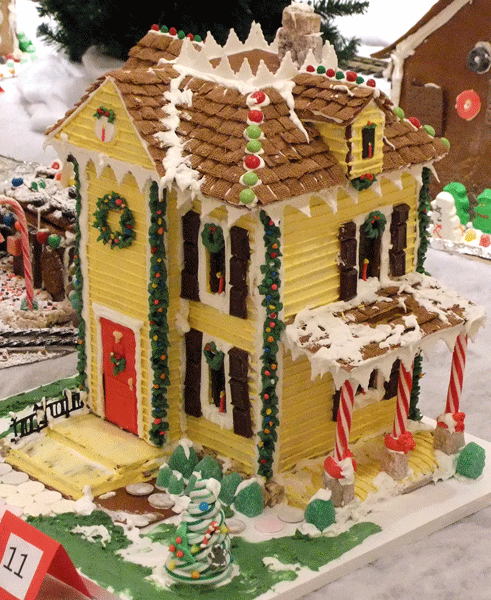 Stop into the Wenham Museum from 4:00 to 8:00 to check out their terrific gift shop as well as the Gingerbread Express model train layout and the Gingerbread Contest Judging. From 6:00 to 9:00 tonight, the Mansion at Turner Hill hosts the 13th Annual Taste of Ipswich Wine & Food Gala. You can taste local fare prepared by Ipswich’s finest restaurants, sip wine, and sample Ipswich and Stone Cat brews, as well as Mercury Soda Pop. This year, the proceeds will benefit the Ipswich Family YMCA. For more information, call the Ipswich YMCA at (978) 356-9622. The Salem fun continues on Saturday, when Santa will make a visit to Coven. Your small person can check out the big guy while you warm up with a coffee and tasty treat. Also on Saturday, Green Land Café will be holding a Toys for Tots drive. Children eat free when they bring a toy to donate. Marblehead continues its annual Christmas Walk this weekend with music, street entertainment, and shopping deals on both Saturday and Sunday. On Saturday, you’ll find two wine tastings. From noon to 5:00, Haley’s will be sampling Y & B organic wines with Neil Deininger. (Even though it looks like a juice box, we like the Sauvignon Blanc) From noon to 4:00, the fun loving BZ Zohn will be back at Shubies with for a tasting of French, Italian, and California wines. Joining BZ will be Demaris Cahoon, owner of Landmark Winery in California, and Helen Gallo of Winebow Imports. If you’re looking for a tree this weekend, stop by Marini Farm in Ipswich. Not only do they offer the kids cookies and crafts with Santa and tractor rides around the farm, but they’re also ladling out free bowls of hot chowder from the Clam Box to help fend off the falling temps. The wonderful Jane Ward has some great ideas, over at Food and Fiction. Media giant Seth gives up the best of Lynn at Lynn Happens. Joey at GMG has the scoop on all that’s going on in Cape Ann at Good Morning Gloucester. Great pick for North Shore Families from North Shore Kid. As we suspect is the case with many of you, we hadn’t been to the Wenham Tea House in years and years. While we weren’t paying attention, manager Emma Roberts completely revamped the place, so when they recently became a Dish sponsor, we drove over to experience The Exchange at Wenham Tea House for ourselves. They still serve tea, of course (Thursday through Saturday from 2:30 to 4:15), but the restaurant has a new chef and now serves gourmet breakfasts and lunches. 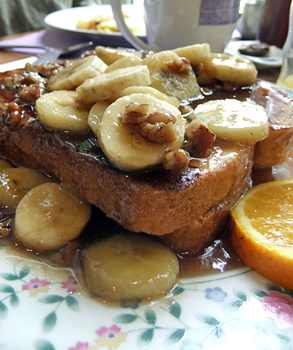 All of the food is made from scratch, including the raspberry jam served with terrific scones and the decadent Crescent City French Toast you see here, which features cream cheese filling, pecans, sautéed bananas, and brandy syrup ($8.75). Roberts, owner of Capers Catering, is a Wenham resident and is clearly enjoying bringing this town landmark back to life. She told us how residents often donate their old china to the restaurant and about her plans to update the gardens and put in a patio for spring/summer use. She has already updated the shop next door to the restaurant, which now features jewelry from local artists alongside appealing cookbooks, whimsical dishes, candles, and hand-made quilts. Right next to the gift shop is Irresistibles, featuring upscale women’s casual wear. There is also a small take-out operation where you can buy the housemade jam, baked goods, and frozen gourmet casseroles. Many of the recipes from the restaurant and shop can be found on Emma’s blog. Also on the website is information on holding an event at The Exchange, which has become a popular spot for children’s birthday parties, bridal showers, rehearsal dinners, and charity events. Mother’s Day, May 9, is fast approaching, and if you still haven’t made any plans to honor mom, don’t panic, we’ve got a few ideas for you. If you’ve got brunch in mind, it looks like Salem is the place. As usual, the Hawthorne Hotel will pull out all the stops to impress, with a huge buffet including both breakfast items and heartier fare, from 10:30 to 7:00 at $40 per adult and $15 per child. The Salem Waterfront Hotel is offering two different options. From 8:00 to 9:00, it’s $26 per adult and $11 for children 12 and under. From 9:00 to 1:30, it’s $30 for adults and $15 for children 12 and under. If you want to make a weekend of it, stay at the hotel Saturday night and receive one free brunch for Mom per room (based on availability). Things that caught our eye on the menu were the mascarpone and lobster scrambled eggs in toasted brioche and the Viennese dessert station. Another deal that might tickle mom’s fancy is being offered by the Peabody Essex Museum. Enjoy a sumptuous brunch prepared by Hawthorne Catering and served in the Garden Restaurant overlooking PEM’s Asian Garden. After your meal, visit the Museum Shop, where you can exchange your brunch voucher for a complimentary gift for Mom! Pickering Wharf also offers plenty of options. Finz will be serving brunch buffet from 11:00 to 3:00; it will include a raw bar and several seafood choices for $35 per person, $16 for kids under 12. Sixty2 on Wharf will also be dishing up brunch. They haven’t published a full menu, but Chef Tony Bettencourt promises pecan sticky buns, brioche french toast, and all sorts of other goodies. Reservations recommended. If you’re looking for something more casual, Victoria Station will be offering a brunch buffet from 11:00 to 3:00 and a dinner buffet from 3:00 to 7:00, at $30 per person. There will be live entertainment with Joe Mcdonald from 1:00 to 5:00. Of course, Salem’s not the only place you’ll find a meal to impress mom. Emerson Inn by the Sea in Rockport serves up a gorgeous buffet with treats like truffle honey glazed salmon over a bed of maple roasted squash and Kahlua Bavarian chocolate trifle, for $45 per person, $22.50 for children ages 3 to 10. Ten Center in Newburyport will host a buffet in their private dining room, where mom will enjoy a complimentary mimosa. They will offer two seatings: 11:00 to 1:00 and 3:00 to 5:00 at $45 per person and $15 per child. If your mom is a traditional sort, she might enjoy a beautiful afternoon tea. 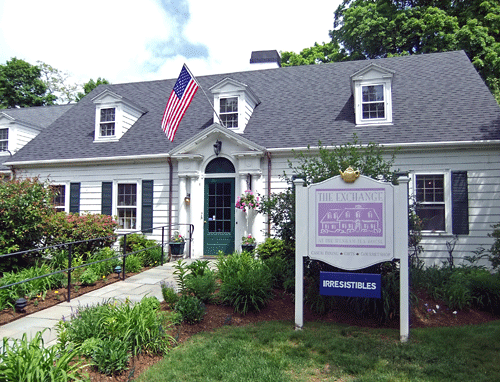 The Exchange at the Wenham Tea House will be presenting their annual Mother’s Day Brunch featuring a la carte specials, along with an afternoon tea. For more details and reservations, call them (978) 468-1398. 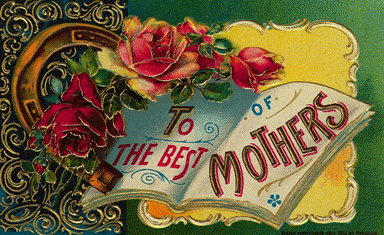 Lastly, there are those of us who find Mother’s Day bittersweet, because while we can celebrate with our children, our mothers are no longer with us. My own mother fell victim to breast cancer almost 20 years ago, and so the Boston Bakes for Breast Cancer yearly event really hits home. During the week up to and including Mother’s Day, local restaurants and bakeries will be selling special treats and desserts, with 100% of proceeds from the sales of the specific dessert going to breast cancer research and care at Dana-Farber Cancer Institute. Here on the North Shore, the chocolate buchon from A & J King Artisan Bakers, one of our all-time favorites, is on the list. Cakes for Occasions in Danvers will be offering a traditional whoopie pie with pink cream filling, and Cassis Bakery in Beverly will have Boston crème pies on offer. Participating restaurants include Duckworth’s Bistrot in Gloucester, Mission Oak Grill in Newburyport, Pellana Prime Steak House in Peabody, and Pellino’s Ristorante in Marblehead. So whether it’s an indulgence for mom or in honor of her, there’s no better excuse to go in search of these sweet treats in the upcoming week.